Grow rack lights went on today for the first time this season. They’re only for the rescued houseplants (orchids, wintergreen, heather)—I guess every plant deserves a place in the sun—but, I’ll be starting super-early lettuce soon, a month earlier than ever, for an experiment in planting them out to the greenhouse at the beginning of March. Getting the grow racks ready is another familiar routine. In early summer, I remove the fluorescent light fixtures and the chains and dowels they hang from and store ’em somewhere (last year, it was on the new Big Shelf). For spring, I dust them off, wipe them down, hang them, and a new seedling season begins! I think your lettuce will make it just fine. We started salad mix 4 weeks ago in our unheated greenhouse and they’re up. Obviously they’re not cranking like they would in spring, but they’re there. I guess your day length is quite a bit different than ours here in Oregon but I cheer you on for the early start. We’ve been doing this early start for several years now and it really lights people’s faces up when you have salad mix first thing at market in the spring. It’s been a warm winter here so far. We might get a bit of snow this week but nothing like what you have. I discovered a lone rocket plant when clearing one of the flower beds before Christmas and that is still producing well. I’m off to buy my seed potatoes today along with some pink and some violet garlic. We hit 12-hour day length around mid-March and days get shorter than 12 hours in late September. So I’m considering the amount of sun as the main constant… Here, when you hit October, no matter how warm the weather, the days get short and growth starts grinding to a near full stop! so here’s a link that shows our day length here in southern Oregon. you can use the site to compare it to yours or any other location. Our frost dates really aren’t too much different than yours. We’re generally safe May 1 but we don’t bet on it. And we have been frost free into October, but again don’t bet on it. We’ll have to compare notes once we start planting in the field to see where things are at comparitively. It’s been a very springlike day here and I had a garden inspection with a fellow blogger today, so all in all, things are pretty great in this neck of the woods! Chris: I see you’re a soil block maker! I think about trying ’em out every year. I should order one this time around. “Farming like there’s a tomorrow…” I guess that about sums it up…! Do you use regular cool fluorescent lights, warm fluorescent, or extra-spiffy grow-lights? I’m starting up my indoor herbs this week, and I’m so confused which bulbs to buy! Anita: For seed starting, you’ll be fine with cool white. That’s what I use. I went through a whole “what’s better” period, and for a couple of years used one cool white and one warm white in each two-tube fixture. The basic “science” is that plants apparently need light in the blue spectrum for vegetative growth (leafy greens! 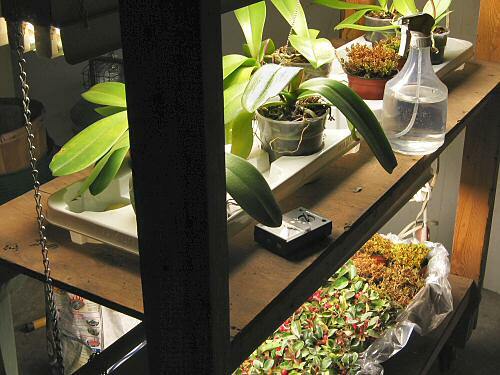 ), and red light for flowering and fruiting, so the idea of mixing is to provide a closer-to-the-real-sun light source. BUT, fluorescent tubes are such a weak, poor substitute for SUN in any case, that light INTENSITY is the real key factor, and this color mixing I found to be an unnecessary extra complication (stocking both types of bulb, rotating trays so they’d get even time on the redder side and bluer side,…) and I didn’t notice any difference whatsoever in any of the veggies and herbs I started. Cool whites are in the most useful blue range. This is based on using mostly mixed cool white-warm white for two years, and all cool white for three years, and many thousands of seedlings. Everything I’ve heard about special “full-spectrum” fluorescent grow lights makes me think they’re more expensive than they’re worth, for the same reason as above. I’ve also thought about upgrading to high-intensity grow lights, like metal-halide, where the intensity is much better. But really, I think all of this is only a big factor if you’re trying to mature plants in artificial light, like100% indoor plants or winter greenhouse growing. For seedlings that’ll be heading outside, on the small scale, cool white fluorescents seems to be the most inexpensively effective route. Oh, yeah, get T-8 fixtures, not T-12. T-8 may be the standard now, but a couple of years ago, here in Canada, they weren’t. T-8’s are narrower, use less electricity, produce more light, AND they produce pretty even light for the length of the tube. The old T-12s are WAY hotter in the middle of the tube, even 2-3 weeks into seedling production, you can see significant growth difference between seedlings near the center and those near the ends of the tube. If you have T-12s, rotate! I use several different types of grow lights and grow vegetables indoors as well. Iâ€™ve been fairly successful too with the only failure being bell peppers. I canâ€™t get those things to grow inside for the life of me no matter what I try. Lettuce grows just fine for me. :) Any tips on this? which is best color fluorescent light for growing orchid indoor ? You can check this source for more details about the colors of grow lights.